Rajiv Surendra was filming Mean Girls, playing the beloved rapping mathlete Kevin Gnapoor, when a cameraman insisted he read Yann Martel's Life of Pi. So begins his "lovely and human" (Jenny Lawson, author of Furiously Happy) tale of obsessively pursuing a dream, overcoming failure, and finding meaning in life. What happens when you spend ten years obsessively pursuing a dream, and then, in the blink of an eye, you learn that you have failed, that the dream will not come true? In 2003, Rajiv Surendra was filming Mean Girls, playing the beloved rapping mathlete Kevin Gnapoor, when a cameraman insisted he read Yann Martel’s Life of Pi. Mesmerized by all the similarities between Pi and himself—both are five-foot-five with coffee-colored complexions, both share a South Indian culture, both lived by a zoo—when Rajiv learns that Life of Pi will be made into a major motion picture he is convinced that playing the title role is his destiny. In a great leap of faith Rajiv embarks on a quest to embody the sixteen-year-old Tamil schoolboy. He quits university and buys a one-way ticket from Toronto to South India. He visits the sacred stone temples of Pondicherry, he travels to the frigid waters off the coast of rural Maine, and explores the cobbled streets of Munich. He befriends Yann Martel, a priest, a castaway, an eccentric old woman, and a pack of Tamil schoolboys. He learns how to swim, to spin wool, to keep bees, and to look a tiger in the eye. All the while he is really learning how to dream big, to fail, to survive, to love, and to become who he truly is. Rajiv Surendra captures the uncertainty, heartache, and joy of finding ones place in the world with sly humor and refreshing honesty. The Elephants in My Backyard is not a journey of goals and victories, but a story of process and determination. It is a spellbinding and profound book for anyone who has ever failed at something and had to find a new path through life. "Lovely and human. The tale of a man who began by following a story and ended up creating his own." ". . . Imaginative, diversion-full, and refreshingly green memoir about the surprises that living a creative life can offer." "A beautifully written journey of self-discovery, The Elephants In My Backyard is intimate, moving, hilarious and painful. 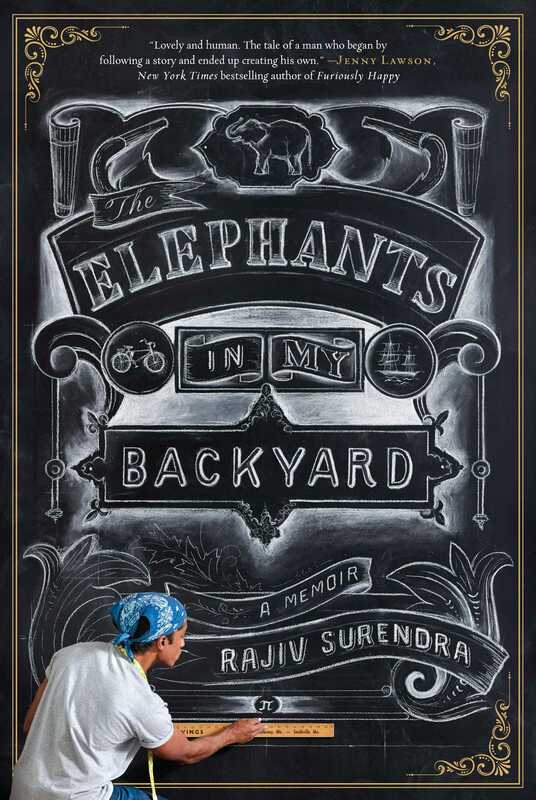 This quirky memoir unfolds in a series of anecdotes—miniature gems—much like the intricate chalk designs that are one of Rajiv Surendra's many talents."